Full Moon Supermoon in Cancer 2018! 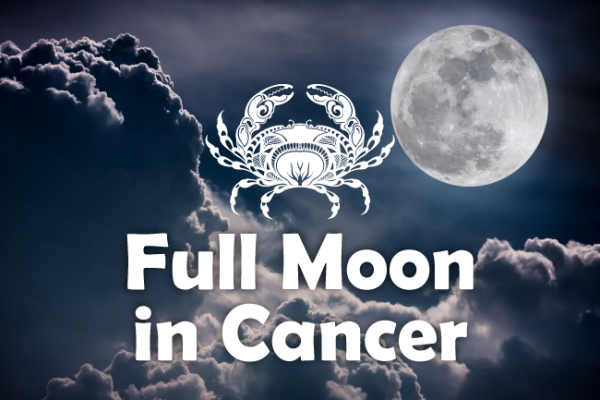 The first and last Full Moon of 2018 happen in the sign of Cancer! If you want to read about the Cancer Full Moon on December 22nd, 2018, click here! On the first nightfall of 2018, the night of 1-2 January we have a Full Moon Supermoon in Cancer at 11 degrees. This is a powerful full moon when people, events and situations loom large, bringing to light vivid memories and exposing deep feelings. The moon is strong in Cancer so don’t be surprised if you go a little “luny” on the night! This is a supermoon, very close to the earth and exerting an even bigger pull for that, so it's safe to say that 2018 makes quite an entrance! Have you written down your 2018 New Year’s Resolutions yet? This Cancer supermoon has the potential to put you in a trance, playing a romantic symphony on your heartstrings, as it forms a possy with Mars and Jupiter in Scorpio and Neptune in Pisces. It’s also opposite the sun (as always) and heavyweight Pluto in Capricorn, which tends to make an indelible impression. Venus and Saturn in Capricorn also pay their respects and, with such an all star cast, practically everything and everyone you care about is up on stage! You've everything to play for. The Cancer Supermoon is like a bow being stretched right across the sky… Pull that bowstring! What does this amazing supermoon in Cancer have in store for you? Horoscope Friends takes up the story, i.e. the horoscope for your star sign. Has the new year kicked off with a bang? If you’re all breathless and wondering where to next, drop us a line on 0207 111 6384 and book a chat with one of our resident astrologers. This is a big family moment, dear Aries! You have a strong sense of roots, heritage, history and of your own inner need to feel grounded and secure. An important property matter could be coming into the spotlight now. A New Year's celebration in your place or a housewarming party could be a great success. Focus within as the year begins and give yourself what you need. All the better to shoot for the stars in 2018! The new year enters in a flurry of news and communications! There’s so much food for thought that you need to take some time and let all the various ideas come to light and be properly digested. A short trip could be the highlight of this full moon or it could be the culmination of a writing and communications project. It’s time to seriously think about your future and make a commitment. This full moon brings a big focus on money! Are you doing your best to bring home the bacon? Have you overspent or undercharged? Or maybe you have a big acquisition in mind? Evaluate your priorities carefully. Decide how to invest your time and money so it will bring the greatest returns and boost your self worth. Getting clear on what you bring to the table will help you better negotiate any financial deals in 2018. This is a crucial moment for you in so many ways, dear Cancer. All the things that are most important to you, driving your life forward, are finally coming into full view. Things come to light, your feelings around a certain situation become clear and this great crescendo illuminates the way forward! What decisions will you make? These will also affect the development of a very important relationship or business partnership down the line. You’re entering the new year transformed, dear Leo! You’ve already seen many changes in your life with the eclipses in your sign. You’re now ready to rid yourself of the final vestiges of your old self! Use this moment to process any past regrets and disappointments. Release. Let go. Let the tide come in and sweep all the emotional debris away. Taking time to rest, put the past to bed and restore your spirit now is just what you need to have a most productive 2018! The spotlight falls on your hopes and dreams for the future, dear Virgo. Are you pursuing your ambitions? Are you surrounded by the kind of people who can support you in reaching your ideals? This full moon might see a dream come true, a celebration or a big social gathering. Being part of the right social network and having nurturing people around you is just the platform you need to express your unique talents and creativity in 2018! This is a big career moment for you, dear Libra! Are you starting this year on the back of a big promotion, title or honour bestowed on you? Everyone seems to be looking to you to take the lead and impose a direction on events and it’s time to make an important decision for your future. Doing so will also ultimately help you support your family, build a more secure home base and set your life on a solid foundation. Your mind is on the bigger picture, dear Scorpio. Are you going abroad for the holidays? If so, this is surely a trip to remember! Alternatively, the spotlight could be on an international, educational or publishing project that’s coming to a head. This looks to be a fantastic opportunity for you, bringing a sense of renewal, possibility and creative inspiration! Getting a clearer sense of your guiding vision now will be of use as the year unfolds and you’re called to handle lots of day to day deals, research and communications. Joint finances are in the spotlight, dear Sagittarius. That’s money you hold with others, money you’re given or money you owe, like shares, bonuses and grants, joint bank accounts, sponsorships or taxes, loans and the division of property. You’re called to take a closer look at your involvements with others on an energetic level - both emotional and financial - and make some decisions. Doing so now will help you focus on building your own resources in 2018 and raising your self (or net!) worth. Are you getting married, dear Capricorn? Or maybe you’re entertaining a major business proposal? Your relationships are highlighted in a big way as the year kicks off. This is no small matter. If you’re already married or in a serious relationship, then your partner might have important news for you. Events now act as a catalyst for your own development in 2018 when you embark on a major, life-changing reconstruction of your appearance, personality and goals. Has this been a working holiday, dear Aquarius? If so, a project comes to culmination around New Year. This brings a sense of fulfilment when you can finally get all your ducks in a row. If the run up to the holidays was pretty stressful, it’s time to rest and tend to your health and wellbeing. This could be the moment when you decide to lose that holiday weight or embark on a major diet and exercise offensive! The universe is on your side! That’s a good way to start the year. This is the most romantic, joyous full moon ever for you, dear Pisces! New Year’s is such a beautiful, loving moment when all you want is to have fun, celebrate and enjoy yourself! You’re highly popular too and sure to be the hottest attraction anywhere you go! That's music to single Pisces’ ears... Just in time for a world full of parties - how's that for good timing eh? A child or creative project is a source of joy. Put yourself out there and shine! This will be your ticket into the life of your choosing in 2018.